Same as the Pro. Bundle. Shipped to your doorstep on CD. Only $5 more, any address! Download and try out Smart Craps for free! Smart Craps is shareware, which means you can download it and try it out for free. You don't even have to tell us your e-mail address or any personal information. Just CLICK HERE to download the latest version. Click 'Save' on the download dialog, save the file to your local hard drive, and then open it. Smart Craps will be installed to your Windows computer, and you can explore the program and documentation at your leisure. Pro Test© dice control metric: Learn about our new Pro Test© dice control test, the most accurate and powerful statistical test for dice control in the game of craps. Instead of needing many thousands of rolls for statistical certainty with tests like the SRR, Pro Test© can tell you in a few hundred rolls whether you are in fact influencing the dice. Professional craps simulation: model every possible aspect of the game, includng rare but important aspects such as odds, payout rounding, commission bets, multiple shooters, extensible betting systems, known and 'blind' betting on shooters, lay bets, random table walkups/shooters, and much more. You can simulate games with SRR shooters, Pro Test© dice controllers, or even random shooters. Easy to use wizards: no need to struggle with setting up complex simulations and tests. Smart Craps includes detailed wizards to guide you through both taking a Pro Test, and setting up simulations. SRR Support (Seven-to-Rolls Ratio): Run craps simulations with different minimum and/or maximum SRR values. Find out what edge you have based on your SRR values. Dice set optimizer: Using the new Pro Test© dice control metric, use our mathematical calculators to immediately determine the optimal dice set for any craps bets, including pass and don't pass. You'll be amazed to find out what the best dice sets are for you at different times in the game. Is the 3V set the best on a 4 point, or does a different dice set make you more money? Smart Craps answers these questions once and for all with mathematical precision. Prove exactly how much money you can make with your Pro Test© dice control skill! Edge calculator: Using the dice influence indicated by your Pro Test results, Smart Craps determines your actual edge at the game for different bets! No simulations or guesses... this is pure mathematical precision, using detailed statistical models to represent your dice control. Add-on betting modules: Smart Craps comes with everything you need to simulate complicated multi-player table craps games. But if you want to test your own betting systems, you can purchase add-on betting modules that go far beyond the built-in defaults. Risk of Ruin (ROR) calculators and simulation: Find out how much bankroll you need to survive in any given game and your unique dice control skill. You can uses our ROR simulator to empirically derive your bankroll requirements through multiple simulation sessions. Or, use our ROR calculators that immediately estimate your ROR from well known mathematical formulas. 100+ pages of online help and documentation: A wealth of detailed help is available at the press of a button in every dialog and at any time. Learn about Pro Test©, proof that it works, and even how to take a dice control test the right way. Command line batch processing: You can run Smart Craps from the command line, allowing you to automate simulation runs and tests with different settings. Roll Recorder for Windows & Palm OS: Recording your rolls during a test can quickly start interfering with your concentration and skill. This companion program to Smart Craps enables super simple Pro test recording for Windows and Palm OS handheld computers. Record each throw with only two clicks on your laptop or handheld computer. Download the roll set results directly into Smart Craps, and you're ready to run simulations and use the dice set optimizer. Click here for more information on the Roll Recorder. Script Betting Module: The ultimate betting module add-on for Smart Craps. This betting module add-on lets you program your own betting systems in simple Basic language (VBScript), right in the simulator. If you know Basic, then you know enough to be able to program any possible betting system for craps. Every property of the simulation state is accessible to you in the Script Betting Module, so you can make bet and dice set decisions on things like the rolls, bankroll, wins, losses, etc. Craps is a game that has been around forever, yet is still viewed very skeptically. Fraud 'systems' that claim you can win just by varying your bets or other bogus methods have always circulated. Smart Craps is NOT one of these fake systems! Below are some common questions about Smart Craps, and craps in general. Is craps really a beatable game??!! Unlike blackjack and a few other casino games, craps cannot be beaten with mathematics and 'brain power' alone. In blackjack, we can learn an advanced card counting system to determine when we have a positive edge (based on the remaining cards in the shoe), and bet more accordingly. There is no similar strategy or system in craps: if you are using random rolls of the dice, you are bound to lose money in the long run, no matter what betting strategy or system you use. There are many scam books and resources that say you can make money simply by controlling your bets (in craps, blackjack, roulette, baccarat, etc. ): this is not what Smart Craps is about! But� this does not mean the game of craps can't be beaten! The answer lies in dice control, the physical skill of manipulating the throws of the dice such that the average outcome is not random, and sufficiently biased to produce a positive player edge given a particular betting strategy. Learn the physical skill of dice control. Confirm, through mathematical tests of your rolls, that you have learned this skill and that you are rolling the dice and generating non-random results with statistical certainty. Determine what positive player edge, if any, your level of dice control skill yields given a specific betting/playing strategy in craps. Smart Craps is all about steps two and three. Since dice control is a physical skill, not a pure mental skill like card counting in blackjack, you will not be able to learn and master it from a book or software program alone. See our Craps and Dice Control Resource section below for more help on learning dice control. What are the computer requirements for the software? 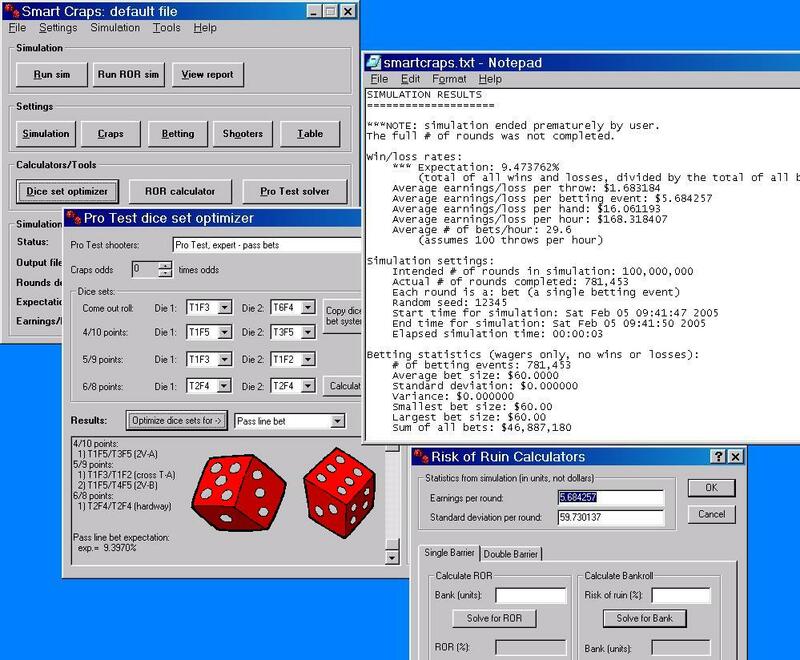 Smart Craps will work on any desktop computer running Windows 98 or higher (i.e. Windows 98 SE, Windows 2000, Windows ME, Windows XP, etc.). 15 megabytes of hard disk space is required. 800 by 600 screen resolution or higher is recommended. Smart Craps does not run on Windows CE handheld operating systems (or Palm OS), since the computing capacity of these small devices is very minimal. Can I read the documentation before I buy Smart Craps? The complete documentation is available in the free shareware version. Just click here to download and install the latest version, and go to the Help menu. Over 100 pages of online help is available covering everything about the program, and much more! Where can I learn more about Pro Test©? A complete discussion of Pro Test© is included in the documentation, with the software. You'll learn how it work, why it works, and even see the mathematical proof, if you're so inclined! Just click here to download and install the latest version, and go to the Help menu. If the software is free to try out, why should I buy it? The unregistered shareware version of Smart Craps will let you fully explore the program and features. But, it will only allow limited rounds during simulation runs, and will prompt you from time to time to purchase a registration ('nag' screens). After you buy the program, you will receive a registration code by e-mail to enter into the program, which will disable ALL shareware 'nags' forever. How much does it cost, and where do I buy it? Smart Craps costs $89.95, and be purchased by CLICKING HERE. Before you buy, make sure you download and install the program by clicking here. You will receive a registration code by e-mail after you purchase that you can enter into the program, to disable all the shareware 'nags'. You do not need to download a new program after buying Smart Craps. You are entitled to free software updates to Smart Craps for one year from the date of your purchase. This may be limited to the features available in version you purchased (i.e. some new features must be bought as optional add-ons). DeepNet backs up it's software with outstanding support and follows through with upgrades and improvements. Can I buy the software on a CD? Yes: you can purchase the software on CD from one of our retailers: www.SmartGaming.com, or www.GoldenTouchCraps.com. They will arrange shipping of the product to you. Alternatively, many of our products, including Smart Craps, are available on CD directly from our store: click here to view our shipped software on CD. Smart Craps is free to download and try out. All you need is a Windows 98 or higher desktop computer, and 15 megs of free hard drive space. The free shareware version will limit the simulation runs and occasionally reset the options. When you're ready to buy Smart Craps, click on one of the links below for our different versions. No need to download anything new... after you purchase, registration codes will be displayed on the final puchase page and sent to you by e-mail. Just enter them into the software, and your software will be fully registered! Smart Craps Professional for Windows... $129.95... includes the Script Betting Module and Roll Recorder. Save 20% off the combined price! The software includes over 150 pages of thorough documentation, explaining everything you need to know to use Smart Craps. All the documentation is available as Windows help, directly accessible from the program by pressing F1 at any time, or from the Help menu. But, if you want to check out the documentation prior to using the program, you can preview it in Adobe Acrobat PDF format. The complete documentation is available as a single large Adobe Acrobat PDF file (7 meg.). You must have the free Adobe Acrobat reader (version 5.0 or higher) installed to view this file (Click here to download the free Adobe Acrobat Reader program). If you only want to read the documentation section on Pro Test©, including the derivation and mathematics of our new dice control metric, Click here for a smaller 300k PDF download). Online casinos for us players offer not only slots, but craps online using state of the art technology to replicate the Vegas style game. The biggest benefit to playing online craps is that players can learn the basics by playing for free. The experts are talking about Smart Craps, and the news is good! "Dan Pronovost is a genius, there's no question about that. His new software SMART CRAPS is truly revolutionary. The concept of the software is to prove you have an edge and to show you how to increase that edge with "cutting edge" dice sets that you may not have even thought about. What startled me was that my rolls were analyzed and while I had a good edge, the software recommended I change certain things about my dice sets at certain times. This increased my edge by quite a bit." "This is revolutionary! You can now with a small sample of throws be able to calculate your real advantage over the casinos when you have the dice! Knowing this advantage you then can decide what bets will return to you the greatest amount of winnings. Now the software will also tell you what set, and again this is revolutionary, to use to maximize your edge!" " If you goal is to be a winner in the casino, Smart Craps is a great tool to help you succeed." Charlie M.: "I wanted to give you some very good feedback on Smart Craps. After passing [Pro Test] and letting the software suggest going to the 3V set for point 5,6,8,9 and the 2V for the 4 and 10 has been amazing. I would have likely never considered going to the 3V set as I�ve had good results with the hard-ways set." Jim C.: "I have purchased the roll recorder and love it." A fantastic hands-on training course for learning dice control. Taught by leading gambling experts such as Frank Scoblete. Dice control cannot be learned simply by reading a book� that would be like learning to juggle without ever picking up the balls! Consider this 'best of class' course with no nonsense or phony 'systems'. By Frank Scoblete (Bonus Books). A fun and very entertaining look at dice control from the inside. Learn what it is like, through Scoblete's incredible stories. By Frank Scoblete (Bonus Books): The classic, best-selling craps book of all time, now updated with new chapters. Introduces the Captain and discusses his revolutionary methods of play, including the 5-Count, the Supersystem and Pushing the House. You'll also read about the Captain's Crew of high rollers and the remarkable lady known as "the Arm" - the precision shooter who became a legend in Atlantic City craps circles. By 'Sharpshooter' (Bonus Books). An excellent and thorough treatment on dice control. Includes excellent mathematical sections on SRR and edge calculations. By Henry Tamburin (Research Services Unltd). A fantastic introduction to the game of craps, covering the rules, bets, and basic strategies. DeepNet regularly contributes articles and analysis reports on craps. We love the math and discipline of dice control, and love to write about it! Click here for a complete list of articles and publications.